Cuppow BNTO Wide Mouth Ball Lid with Jar. Tired of soggy or boring salads for lunch? Looking for inspiration for your food on the go? Our lunchbox insert (the Cuppow BNTO) and a wide mouth jar have teamed together to bring you a jar that is basically in 2 parts. The Cuppow BNTO sits at the top of the jar and is held in place with the jar lid. In this, you can put salad dressing, dips, chocolate sauce, yoghurt, stewed fruit, mixed nuts, croutons and any other food item that you want to keep separate from the food held in the bottom section of the jar. 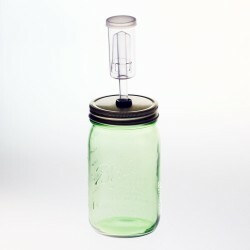 The Cuppow BNTO (ben-toh) is a canning jar adapter for bringing great food with you on the go! We took inspiration from Japanese bento boxes and created a conveniently shaped insert that separates a canning jar into two compartments so you can mix or dip like a champ. Replaces round flat tin plate on any Ball Mason Wide Mouth Jar One Cuppow lid for wide mo..
One Cuppow lid for wide mouth sized canning jar One Wide Mouth Pint Jar (clear glass) ..
One BNTO lunchbox adaptor for use with a wide mouth canning jar (jar sold separately). Ma.. Preserve your food the natural way with this 1 Litre USA made Fermenting Jar. 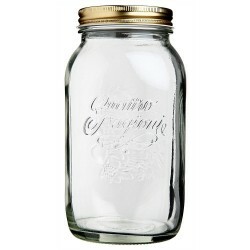 Fermenting food is th..
Bormioli Rocco Quattro Stagioni 1.5l Preserving Jar. Comes with 86mm lid. 21cm high,11.3cm round. ..